Always make sure the taxi meter is not covered and is clicking over from the start point. I once was in such a hurry I did not notice the meter was covered with a cloth. After two minutes of driving I asked the taxi driver to remove the cloth and he pretended he was deaf and spoke no English. I carried on insisting until he gave in and there on the meter was a charge of over p300. For a TWO minute drive. My word I was annoyed. I asked the driver to reset the meter and as cool as a cucumber he told me it was a very special hotel pick up charge. I told him he did not pick me up at a hotel and he advised me there was one near. Unbelievable. Well despite my repeated insistence of resetting the meter he totally refused. I asked him to let me out and he totally refused. I shouted at him, thumped his seat and still this man was not going to change his mind. We were going to the airport and the fare overcharge was all OK for him. In the end I told him if he did not stop the taxi I would open the back door and call the Police. He smiled and assumed I was not really going to do that. Well he was wrong. I opened up the door and heard all the cars around me hit their horns and my stubborn driver had to stop or lose his door. Lucky for me the Police were near and could see this and came over straight away. The loud voices from the driver and other drivers and even the police carried on for a few minutes with NO ONE asking me anything. To my surprise the policeman apologised to me and flagged me down another taxi. I have no idea even now why the police did not speak to me and why they assisted me in getting another taxi. I was not even asked to pay any fare! No matter what taxi you pick up and use you MUST ask the driver to put the meter on. Many will claim they are special taxis, especially from the airport. Some produce force Tariffs saying you have to pay five times more than it should be. Don’t panic and just say no and get out. Trying to talk to a driver who would do this cannot be trusted in any way. Just find another taxi and let him suffer. Never let the driver bring anybody else into the taxi and always take a picture of the number written on each door. 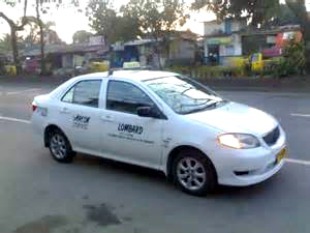 This is the Taxi ID and number of the operator. Make it obvious you are taking the picture. The good drivers will not be bothered the bad ones know they are not going to be able to fleece you.